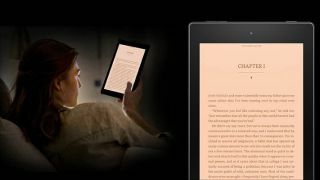 Amazon has launched a new "Reader's Edition" of its Fire HD 8, which it optimises the tablet for reading books. The way it works is that it slaps a special "blue shade" mode, which can be switched on and which will reduce the amount of blue light emitted by the screen. This creates a more pleasurable reading experience, as it's the blue light which causes eye strain and which stops you from falling asleep. It means that the tablet is better optimised for use in low-light conditions - such as when you're lying in bed, and want to crank the brightness down to the lowest setting. When you're reading in blue shade mode, it will consume less battery power, and you can apparently expect your tablet to last 25% longer. If this sounds familiar, it is because last week the company rolled out a software update that does the same thing to the other Fire tablets. Under the hood, the tablet is the familiar mid-range Fire HD 8, which has an 8" HDish display (running at 1280x800), a quad-core 1.5GHz processor and 5MP camera on the rear. Sure, it is no iPad Air 2, but if you want to use it mostly for reading it will do the job. To make the Reader's Edition particularly appeal, Amazon is throwing in a year of Kindle Unlimited, which gives users access to a Netflix-style library of around 1m titles, as well as a "rustic brown" leather case to make it feel more like a book. Despite positioning the Reader's Edition as a new product, it appears that these are the only two truly new features. So far the Reader's Edition is only listed for sale on the US Amazon website for $249.99, where it's currently available for pre-order. This works out at around £170/$350AUS - a premium on the standard Fire HD 8, presumably to make up for the 'free' Kindle Unlimited subscription. Here's our review of the regular Fire HD 8.